What's on now? What can I do at this time of year? Bounce on the water trampolines, splash into the water, test your balance and agility on the moonwalk or whizz down the big waterslide! Explore the Fermanagh Lakelands with one of Corralea's qualified instructors, or go solo with our canoe hire service. Test your aim on our range. Great for all ages and abilities! Ideal for all types of groups from young to old. Our state-of-the-art climbing walls has 4 different sides of varying difficulties. MTB trails on site, pump track, skills area, equipment hire and tuition on site. Buy an unforgettable Activity Voucher. Perfect for unique gift ideas for men, women or couples. For current events please visit out facebook events page. Slides, trampolines, catapults, balance buoys and much more!! Our waterpark sessions are uniquely instructor led for your safety and enjoyment! Fun for the whole family under the watchful eyes of Corralea’s lifeguards. Why not hire a canoe and paddle around the waterpark while the kids get wet!. Book a private session for your group or enquire about our Summer public sessions. When can I go on the waterpark? Corralea Activity Centre Ltd. is open all year round but the waterpark is only open from May- Sept. For group bookings or private sessions including birthday parties, contact the office for a date & time. For individuals: Waterpark is open in July and August during our Summer Buzz Programme. Check our Summer Buzz programme for details! Do I need to be able to swim? Yes, you need to be able to swim. Is there a minimum age? Our minimum age for children on their own is 9 years old. Younger children (6-8yrs) can go on the water trampolines provided a parent/guardian accompanies them, they can swim and conditions are suitable. This is at the discretion of the management. What do I need to bring? We provide all specialised equipment: wetsuits, buoyancy aids. You need to bring a swimsuit, towel and old trainers (to wear on the trampolines). What about insurance? Corralea Activity Centre Ltd. has full public liability insurance. The centre requires a booking form to be completed with relevant medical information about participants prior to activity. All sessions are led by fully qualified Instructors. A range of canoes and activities available for all ages and skill levels. Sit-on kayaks can be hired for ½ day, full day or a few days (canoe trail). Canoe Hire is available generally from Easter to September but is weather dependent. We recommend canoes are booked in advance and we reserve the right to cancel the canoe hire if the weather conditions are dangerous (high winds, too stormy,…) or the hirer is not fit to paddle safely. You must be over 18 years old to hire a canoe and be able to swim. Our Centre is also part of the Erne Canoe Trail and you can hire canoes here to start your journey through the Macnean Basin, follow the Arney River on to Lough Erne. A pick up service can be arranged (at an extra cost) for people who wish to follow the canoe trail and camp overnight. Erne Canoe Trail map indicates appropriate camping sites, etc..) We provide dry bags for personal gear. Canoeing Session led by Corralea’s staff When can I canoe ? Corralea Activity Centre Ltd. is open all year round but the type of canoeing session you’ll experience will depend very much on the time of year you undertake it. You pick your date and check availability with the centre. The more notice you give us, the better chance to secure a date (at least one week notice is advisable). Can I go alone or do I need to be part of a group ? We offer canoeing for individuals or groups. In July and August canoeing sessions are scheduled for individuals and families on certain days: check our Summer Buzz… programme. Where can I canoe ? Our centre is based on Upper Lough Macnean, 3 miles from the village of Belcoo. Our canoeing sessions take place on the lake near the centre, where you will master some of the essential skills of canoeing, visit small remote islands and discover the local heritage. Do I need previous experience ? No. But you must be able to swim. Is there a minimum age ? Our minimum age for a group of children is 9 years old. Younger children can go canoeing provided a parent/guardian accompanies them and conditions are suitable. This is at the discretion of the management. What do I need to bring? We provide all specialised equipment: wetsuits, buoyancy aids, helmet, canoe + paddle. You need to bring a swimsuit, towel and old trainers (to wear in the canoe). Your Canoe Instructor will bring a first aid kit and any other relevant equipment. What about insurance ? Corralea Activity Centre Ltd. has full public liability insurance. The centre requires a booking form to be completed with relevant medical information about participants prior to activity. All sessions are led by a fully qualified Canoe Instructor. What is the difference between canoeing and kayaking ? The main difference is the craft used but the term canoeing is used generally to refer to the use of a boat propelled by paddles. At Corralea Activity Centre Ltd. most of our canoeing sessions use sit-on kayaks. These boats are safe, unsinkable, and very reassuring for the novice or anxious canoeist. Feel the weight of the bow, pull the string and listen to it tension as you control your breathing, ready to send your arrow piercing through air and into the target. Will you find your mark well, and win the competition? Archery sessions are carried out on site, on our large lawn overlooking the lake and surrounded by natural forest. Qualified instructors will provide tuition. Archery is ideal for all types of groups: from young people to elderly adults. An Archery session lasts 1 hour. We provide Bows of different sizes, left and right handed. When can I do archery? Corralea Activity Centre Ltd. is open all year round but the archery range is usually more active from May to Sept.
You pick your date and check availability with the centre. The more notice you give us, the better chance to secure a date (at least one week notice is advisable). Can I go alone or do I need to be part of a group? We offer Archery Sessions for individuals or groups. In July and August archery sessions are scheduled for individuals and families on certain days: check our Summer Buzz… programme. What do I need to bring? We provide all specialised equipment: bows of various sizes (adult and junior), arm braces and finger tabs. You need to wear comfortable warm clothes e.g. Tracksuit, fleece, warm socks and bring a waterproof. What about insurance? Corralea Activity Centre Ltd. has full public liability insurance. The centre requires a booking form to be completed with relevant medical information about participants prior to archery session. Orienteering is a great, fun and enjoyable activity which can be enjoyed at any age. We have our own small (10 posts) orienteering course on site here at Corralea. However should there be a need for more adventurous terrain and distance there is a larger (30 posts) course in Florencecourt Forest Park at only 15mn drive from the centre. First outdoor all weather purpose built climbing wall in Ireland !! Over 30 feet high, and with 4 sides of different difficulty levels, will you be able to conquer the climbing wall? On site, surrounded by natural forest, our tower/wall has four sides with various levels of climbing route difficulty… ideal to suit all levels of ability. A climbing session lasts 1 hour. Shoes and Harnesses provided. When can I climb? Corralea Activity Centre Ltd. is open all year round and climbing is available all year round but the wall is outdoors it is therefore more pleasant in the summer months. Can I go alone or do I need to be part of a group? We offer climbing for individuals or groups. In July and August climbing sessions are scheduled for individuals and families on certain days: check our Summer Buzz… programme. What do I need to bring? We provide all specialised equipment: harness, helmet, climbing shoes. The centre requires a booking form to be completed with relevant medical information about participants prior to climbing session. Accompanied by our experienced guides, our state of the art, electrically assisted mountain bikes will allow you to explore forests and rugged Fermanagh countryside with ease and comfort. Explore with us ancient bog roads and forest tracks. Visit www.EbikeNI.com for more info! Using our standard MTB or our NEW Ebikes your biking experience can be tailored to suit all levels of fitness. When can I mountain bike? Corralea Activity Centre Ltd. is open all year round and mountain biking is available all year round. Can I go alone or do I need to be part of a group? Corralea Activity Centre Ltd. operates with individuals or groups of 7-8 people at any one time. For individual sessions (up to 4 people) you can choose between our standard MTB or our new electric MTB. A typical Mountain biking session Meet your instructor for trip. Allocation of biking equipment (bike, helmet). You will get familiar with your bike with a short skills warm up and depending on your outing will travel offsite to the relevant trail. Bikes are transported by the centre. You travel with your own vehicle. If you are doing the centre trail or pump track you will stay on site. You can experience a mountain biking session (1/2 day or a full day) or as part of a week-end away. We provide all specialised equipment: bike, gloves, helmet, water bottle. You are welcome to bring your own bike and helmet if you wish. You need to wear comfortable warm clothes e.g. Tracksuit, fleece, warm socks and bring a waterproof. If you are coming to the centre for a full day, bring a packed lunch. Your Trail Leader will bring first aid kit and repair kit. Have you got what it takes to explore the subterranean labyrinths of the Fermanagh limestone cave network? One of the only centres in Ireland to offer a Wild Caving Experience! All participants must have a minimum level of fitness. This level of course will depend on the difficulty of the cave trip. All caving trips in Fermanagh / Cavan are weather dependent. The high rainfall in this part of Ireland together with our changing climate can affect the conditions in the caves very quickly. Therefore we reserve the right to cancel / postpone any trip at short notice for safety reasons. All caving trips are led by a qualified Cave Leader. Can I go alone or do I need to be part of a group? Corralea Activity Centre Ltd. operates with both individuals and small groups. In the Summer caving is offered as part of our Summer Buzz programme for groups of minimum 4 people. However caving for smaller groups and individuals is possible. Contact the office for details. What kind of cave can I experience? Our policy is to know our customers’ physical capabilities before attempting any difficult cave, therefore all our customers will start with a beginners’ caving trip before any other cave can be considered. What is a beginners’ cave? It is a dry or wet horizontal cave. In a dry cave it includes walking in large passages, walking on all fours and optionally crawling through smaller passages. In a wet cave, you will experience walking, crawling and wading through water. You’ll witness complete darkness and discover sounds and smells of the cave environment. Information will be given on the geology, hydrology of the Cave and its inhabitants (bats, etc…). We will share with you any folklore attached to the caves and the locality. The Caving trip will be carried out in an environmental friendly manner as in the training given by Speleological Union of Ireland to all Cave Instructors. Each trip will last ½ day. You can experience two different caves in a Full Day. What do I need to bring? We provide all specialised equipment: boots, wetsuits (for wet caves), oversuits, gloves, helmet, light + belt. For a dry cave, you need to wear comfortable warm clothes e.g. Tracksuit, fleece, warm socks. For a wet cave you need a swimsuit, towel and warm socks. Always bring a complete change of clothes to use after your caving trip. Your Cave Leader will bring spare lights, first aid kit and comfort sac (extra clothing left at entrance of cave). The centre requires a booking form to be completed with relevant medical information about participants prior to caving trip. All trips are led by a fully qualified Cave Leader. We can train you with ladder and lifeline in order to descend into a vertical cave with a short pitch. The ladder and lifeline training will be carried out above ground and only when we are satisfied you can complete this exercise, will you be taken underground. Training normally will take ½ day. For these 2 options we will be working with smaller groups of people. If you want to explore deeper pots and shafts you will need to use SRT (Single Rope Technique). Corralea Activity Centre Ltd. does not offer this level of tuition. Harness the winds of Lough MacNean to speed your way across the water. Only 16 miles as the crow flies from the Atlantic Coast, we benefit from the powerful Westerly Winds which come off the Atlantic and swoop down the Melvin and Macnean valleys. Result: plenty of wind for Corralea Activity Centre’s windsurfing courses, all in the safe environment of an enclosed lake. Corralea Activity Centre Ltd. is open all year round but windsurfing is offered from May to Sept. for beginners and intermediate levels. Can I go alone or do I need to be part of a group? Corralea Activity Centre Ltd. operates with individuals or groups. In the Summer windsurfing is offered as part of our Summer Buzz programme where a minimum of 4 people is required. However private tuition is possible for individuals. Where can I windsurf? We do windsurfing on site on Lough Macnean. Initially you will windsurf between islands in the secure bay area close to the centre and then progress out into the open part of the lake. Do I need any experience and what will I learn? No, no experience is needed, however you need to be a competent swimmer and be physically fit. You will practise on dry land with board and rig first before you go in the water. Our instructors will teach you how to stand on the board, haul up the rig, sail out onto the lake and self rescue. Our rescue boat will be on the lake to assist you at all times. By the end of your first session you should be confident on the board going straight and attempt turning manoeuvres. Each session lasts 1/2 day. What do I need to bring? We provide all specialised equipment: wetsuit, buoyancy aid, board and rig. Our boards are Hi-fly large volume boards which are ideal for beginners. We have a selection of sails from 2m² to 4.5m². You need to bring a swimsuit, towel and old trainers. Your Windsurfing Instructor will bring first aid kit and comfort sac. The centre requires a booking form to be completed with relevant medical information about participants prior to activity. Corralea Activity Centre Activity Vouchers and gift ideas. Buy an unforgettable gift for somebody special. When can I use my Activity Voucher? Corralea Activity Centre Ltd. is open all year round but some activities are only seasonal. Check date and availability with the centre. All activities have to be booked in advance and are weather dependent. How long is the Voucher valid for? Vouchers are valid for 12 months. Do I need any experience? No, no experience is needed for any of our vouchers, however you need to be a competent swimmer for water activities and have a thirst for the outdoors. What do I need to bring? We provide all specialised equipment: wetsuits, oversuits, helmets/ lights. You need to bring a swimsuit, towel and old trainers. What about insurance? Corralea Activity Centre Ltd. has full public liability insurance. The centre requires a booking form to be completed with relevant medical information about participants prior to activity. Discover our brand new E-Bike tours! State of the art, electrically assisted mountain bikes allow riders of all levels to explore great distances at minimal effort. Natural underworld of rivers, waterfalls, winding passages and lofty chambers! Explore the enchanting caves of Fermanagh. Harnessing the powerful westerly wind, you'll be able to swoop around Lough Macnean with your friends. Choose from a selection of unique experiences. Perfect for those looking for thrill and adventure! Corralea Activity Centre has a range of fun activities and packages to suit everyone. Whether a family or a groups of friends, take advantage of our onsite accommodation and our discounted prices! Activities are chosen from our Summer Buzz Programme available in July & August. 1 Activity voucher per person for a 1 hour Activity. What about a hen / stag week-end with a difference….. Go surfing, try water trampolining or explore Fermanagh’s caves… HEN or STAG goes FREE for 8 + paying !!! Our package include: 2 nights accommodation + Outdoor Activities all day Saturday All activities are run by qualified instructors. All equipment provided Combine the privacy of our cluster of cottages with an exciting programme of activities to make this week-end a memorable experience!! Our self-catering cottages are nestling in a natural woodland setting on the shores of Lough Macnean. Why not organise a barbecue by the lake or beside our tipi on your first night? These are only a stone throw from your cottages… On Saturday before your Hen / Stag evening try canoeing, caving, mountain biking, waterpark etc… Guaranteed to get you on a high before your night out!! The local taxi firm can bring you to Enniskillen or you may prefer to select some of the first class restaurants in Belcoo / Blacklion. Go Mountain biking, try water trampolining or explore Fermanagh’s caves…. Explore the wilderness of the West of Ireland with our guide: cruise along old bog roads and forest tracks, savour the sweeping views over Lough Macnean from the comfort of your electric mountain bike! Explore the magical forests and the mystical caves where scenes from Game of Thrones were filmed. Shoot and Ride to Beric Dondarrion’s Hideout! Learn the skills of an archer on our range then put them to the test in our forest in search of hidden animal targets. After lunch hop on an ebike (Electric Mountain Bike) and cycle to one of Game of Thrones filming locations (Pollnagollum Cave). Take pictures of the stunning waterfall entrance of Pollnagollum Cave- and explore the Hideout of Beric Dondarrion- with our cave leader. On your way home stop in the listed Victorian pub “Blakes of the Hollow” in Enniskillen to see Game of Thrones Door number 4. Price based on 4 people sharing a cottage, includes self-catering accommodation for 2 nights in Corralea cottage + activity experiences, all tuition and equipment. Discover the depths of Fermanagh & Cavan, explore underground passages & streams, marvel at formations hundreds of years old. Experience, walking, crawling and wading through water. Discover sounds and smells of the cave environment and complete darkness. Learn about the geology and hydrology of the Cave, its fauna and the folklore attached to it.All specialised equipment provided. Led by a qualified cave leader. Immerse yourself for a whole week-end in the tranquil surroundings of Corralea’s forest, hire a canoe or a bike or if you feel more energetic go for a hike up the “Staircase to Heaven” and tick it off your bucket list !!! In the evening chill out in your cottage, take a stroll by the lake or visit the local pubs for live entertainment. 2 nights self-catering in a cottage, 4 people sharing. Instruction & tuition & all specialised equipment. Enjoy a relaxing adventure tour on the Lough Erne Canoe trail. Take a break from the bustling towns and cities and chill out in the countryside. Enjoy 2 peaceful nights self-catering in our cottage on the lakeshore. In the morning pick up your canoe and explore with our local guide the Lough Erne canoe Trail to discover mysterious islands, crannogs and the rich local folklore. Stop for a spot of lunch and continue your journey gliding through unspoilt waters. Discover the Lough Erne Canoe trail. Have your own private group session to make it a birthday to remember. Youth groups, schools, scouts, guides, youth clubs Looking forward to a holiday with your children… fancy trying some outdoor activities and sharing some unforgettable experiences… Let Corralea Activity Centre do all the organising, …all you need to do is pick your dates and contact us. We’ll offer you and your family an unbeatable Package price for your summer holiday. Our packages include accommodation in self-catering cottages for 5 or 6 people + activity vouchers to use during your stay. You can join the children for activities or opt to relax and watch them… This is your holiday, you can do as little or as much as you want…. 3 small steps: 1. Choose your Package: 3 nights or 7 nights 2. Choose your cottage: Corralea cottages accommodate up to 5 people, Pinetree cottage is more spacious, accommodates 6 people and has wheelchair access. You can view the cottage on our dedicated pages: Corralea cottages, Pinetree cottage. 3. Choose your dates: give us a ring at +44 2866386123 or send us an email at info@activityireland.com to check availability. Once your dates are secured, choose your activities. Your activities must be booked on the booking form. Our activities are suitable for children 9+ (or 6+ if accompanied by an adult). Packages include pre-paid Activity Vouchers, you can buy more activities once you are here if you wish. An ideal venue for school trips, youth clubs, scout outings, church groups, special celebrations. All our activities are on site within walking distance from each other. Contact the office for a quote for smaller or larger groups. Price includes tuition and specialised equipment. NO HIDDEN COSTS. Staff Day Out: light-hearted & fun day out to consolidate bonding. Go west, go wild, get wet in Fermanagh… canoe to an island, bounce and splash on the waterpark, beat your boss on the archery range, climb the North Face of our climbing wall or go underground caving….all this with friends and colleagues. Guaranteed fun and excitement for your Staff Day Out !!! Your Day includes: qualified instructors – good staff-customer ratio – all specialised equipment – Public Liability Insurance – Changing Facilities on site. A lunch can be organised in nearby village. See what our previous adventurers had to say about us on TRIPADVISOR. Arrived here on Friday evening for hen weekend with 7 other girls. Were given 2 lovely houses. Marius was so good and helpful. Next morning we did archery and wall climbing with Johny the instructor which was brilliant. Afternoon we did canoeing and water park. Loved the canoeing so much ,Johny was brilliant and felt so safe. Water park was so much fun. Have nothing bad to say bout corralea activity centre. Whole experience was excellent. I remember going on school trips to here so we booked a trip to it last summer to see if it was as fun as we remembered. We were pleasantly surprised! The waterpark has grew since we last visited there was so much to do, canoeing, archery and the waterpark to name a small select few! Wet suits and life jackets were included in our price. It was so good that we intend to visit again this summer! Best summer fun we have had!! We took our children along to the Corralea Activity Centre, to play on the water park. 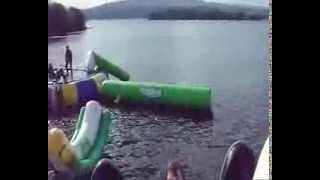 Situated in beautiful countryside they have a series of inflatables that are anchored to the lough floor. Wet suits and life jackets/buoyancy aids were provided for all. All the children thoroughly enjoyed themselves and hope to return when next in the area. The staff were very helpful especially Hannah who took the younger ones under her wing. A hidden gem in the Fermanagh countryside, Corralea Outdoor Activity Centre can cater for all of your getaway and tourism needs. Corralea Activity Centre Ltd. is a family run outdoor activity business based in Co. Fermanagh, N. Ireland. 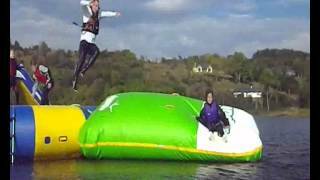 It was based in west Fermanagh for 5 years as a mobile activity centre, and has grown to a complete lakeside Outdoor Activity Centre and accommodation facility, purchased in 1994 and operating under the name of Corralea Activity Centre. Corralea Outdoor Activity Centre, Co. Fermanagh, Northern Ireland is a family run Activity and Holiday Centre, set in the heart of the beautiful Fermanagh Lakelands. Corralea Activity Centre is ideal for those who love to get active outdoors in clean air, unpolluted waters and natural woodlands. Activity packages combining accommodation + activities.